Gravity is that rarest of beasts, a big budget Hollywood movie that even indie fans have got excited by. It's the film that has finally convinced the sceptical (well, not all of them) that you can make a decent movie in 3D after all and now it looks set to be showered with Oscars. If you missed at the cinema or just want to watch it all over again on a smaller than IMAX screen, then the upcoming Blu-ray and DVD release should be just what you need. Dr. Ryan Stone (Sandra Bullock) is a brilliant medical engineer on her first shuttle mission, with veteran astronaut Matt Kowalski (George Clooney) in command. But on a seemingly routine mission, disaster strikes. The shuttle is destroyed, leaving Stone and Kowalski completely alone, tethered to nothing but each other and spiralling out into the darkness. The deafening silence tells them they have lost any link to Earth...and any chance for rescue. As fear turns to panic, every gulp of air eats away at what little oxygen is left. But the only way home may be to go further out into the terrifying expanse of space. Directed and co-written by Alfonso Cuarón (Y Tu Mamá También, Children of Men) and produced by Alfonso Cuarón and David Heyman (the Harry Potter films), Gravity has become one of the most honoured films of the year, garnering 10 Academy Award nominations, including Best Motion Picture, Best Performance by an Actress in a Leading Role and Best Achievement in Directing. The film has also received 11 BAFTA Award nominations and 10 Critics’ Choice Award nominations, both including Best Picture, Best Director and Best Actress (Bullock). Cuarón recently received a Golden Globe Award for Best Director. Gravity has also won Best Picture awards from several prestigious critics organisations, including the Los Angeles Film Critics Association, and has been included on 395 critics’ and critics groups’ top ten lists, as well as being named one of the AFI’s ten best films of the year. It was also announced as the year’s best reviewed film by the website Rotten Tomatoes. 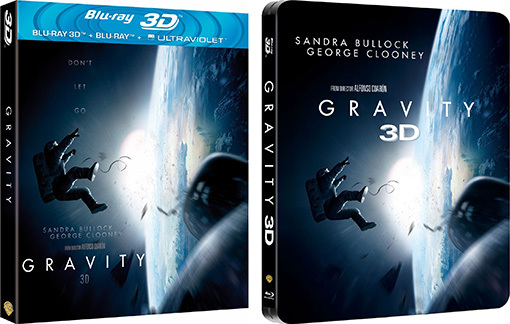 Gravity will be released on UK DVD, Blu-ray and 3D Blu-ray on 3rd March 2014 by Grapevine at the RRP of £19.99 for the DVD, £24.99 for the regular Blu-ray, £29.99 for the 3D Blu-ray and scary £34.99 for the 3D Blu-ray Steelbook Edition.